For a very limited time only—the next 15 hours, to be exact—the Instant Pot Duo Mini, one of the most popular (and useful!) kitchen appliances of all time is on sale for $56, marked down 30 percent from its $80 MSRP. This is a really good deal—and a great opportunity to pick up an Instant Pot without shelling out hundreds of dollars. The Instant Pot Duo Mini is ideal for smaller households, apartment-dwellers (because of its smaller kitchen counter footprint), and anyone who’s looking to try out the wildly popular cooking gadget. It’s also a great supplemental side-Instant Pot for anyone looking for an easy and convenient way to cook up side dishes—without breaking out a full suite of pots and pans. Designed to cook two or three portions in each go, the Instant Pot Duo Mini combines “seven kitchen appliances in one”—it can do the job of a (12-cup) rice cooker, a pressure cooker, a slow cooker, a steamer, a sauté pan, a yogurt maker, and a warmer. Some kitchen wizards have even started to make their own Instant Pot wine. The Duo Mini is so petite and portable, it can also be a useful gadget to take on trips—especially if you’re camping near a power source, traveling in an RV, or spending a few days on a boat. It comes with everything you need to make complete one-pot meals (except the food, of course): a rice measuring cup, a steam rack, a rice paddle, a soup spoon, a condensation collector, and even a recipe booklet full of ideas. 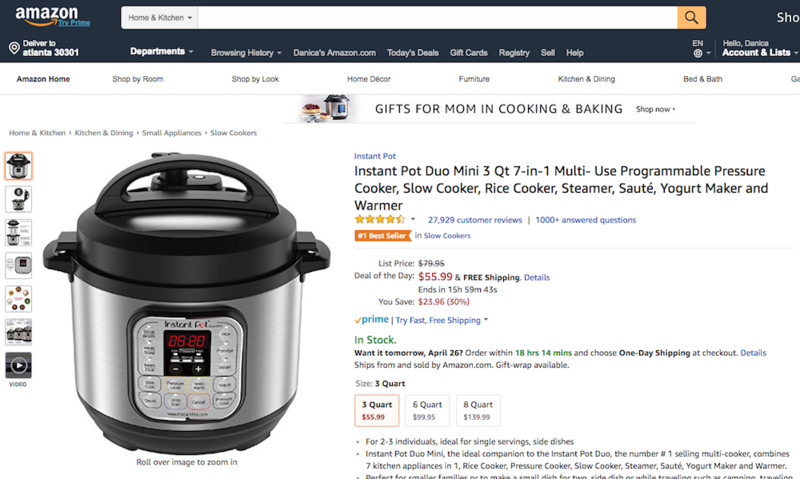 Instant Pot Duo Mini, on sale today for $56 (down from $80) at Amazon.com.